This entry was posted on august 18, 2014 by HansHB. It was filed under Aktuelt, art, bilde, Ein Stück Himmel, Foto, Fotoblogg, Fredda', Himmelsk, Mandarin Orange Monday, MellowYellowMonday, Natur, Nikon, Nikon blog ambassador, Sky Watch Friday, SkyWatch, Weekend Reflections and was tagged with A Farewell To Summer, AF-S Nikkor 24-70mm f2.8G ED, Avskjed med sommeren, bilde, D4, Ein stück himmel, foto, fotografi, Fotosafari, fredda', fredda'n, Himmelsk, Lofoten, Midnattsol, Midnightsun, naturfotosafari, nikkor, Nikon, Nikon D4, Nordland, Norge, Norway, NRK, NRK Trøndelag, Pstereo 2014, Røst, Reflections, Sky Watch Friday, sommer, Vestfjorden, Weekend Reflections. GUAUUU, QUÉ COLORES!!!!! EXCELENTE TRABAJO. gorgeous photo. I like fall though too. Og for en sommer vi har hatt! That’s a great goodbye to summer, Hans. Wonderful timing with the sun just behind the mountain and the contrail just above it as a bonus. A beautiful image of day in summer ! Another gorgeous shot ~ composition and contrasts and magnificent color! I love that sky so poetic, exquisite colors, an appealing silhouette, great artwork! That’s a beautiful send-off, but I’m not ready for it to leave. 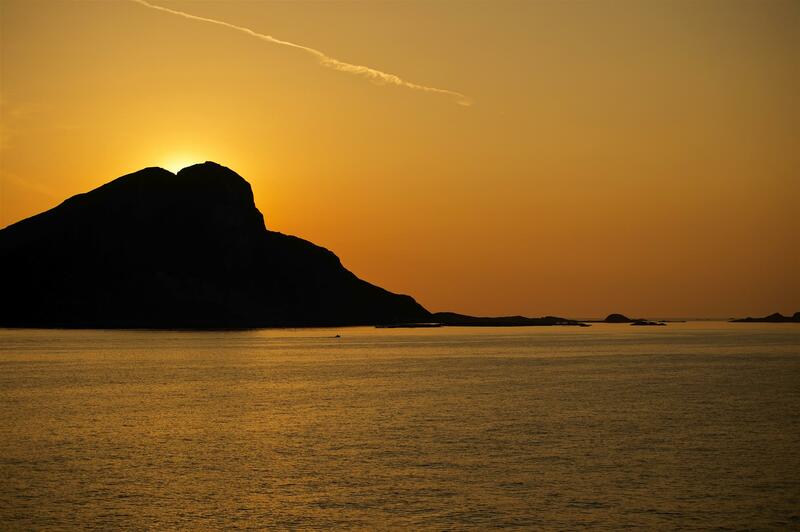 the midnightsun make it all golden, amazing picture! Love to from Dina and myself! Fint bilde! Det har vore ein flott sommar som no går mot slutten, og vi kan ynskje hausten og ikkje minst det flotte haustlyset velkommen. Vert nok mange fine bilder å fange i månadane framover! Lovely colours! we get some amazing sunsets here, we’re just going into spring so hopefully I’ll get some photos as good as yours. Your midnights are so lovely. Glorious, golden skies and a terrific capture for the day and what a farewell to summer!! Thanks for sharing the beauty!! Have a great weekend, Hans!! det var en riktigt apelsinfärgad solnedgång. Eller var det uppgång. 🙂 Snyggt i alla fall. Beautiful color in your late night sky! Beautiful golden sky and a great water and landscape. Wow, gorgeous color! A beautiful sky capture! A beautiful way to say good bye to summer! Here in the desert we are ready for some cooler weather. A spectacular capture Hans. Thank you for sharing. Always a pleasure to visit. Fantastic photo! That is a fine farewell, but I’d hate to say goodbye. A beautiful capture with the hidden sun. this is simply spectacular. i love it. Awesome capture of midnight sun! The sunset color is so amazing here… What a pretty picture. Sun is hiding behind the Mountain 🙂 Great pic! Great shot! Fortunately for me, your summer end means my winter end. So beautiful Hans. We experienced long long days for the first time up here in Alaska this summer…. we were here on June 21 and tried to stay up all night to admire it. (Didn’t get such wonderful pictures s you did . Oh, I love this midnight sun. You caught the sun right on top. Well done. Ah, and this golden Colors. A masterpiece, would make a good poster.